A customer using Safeway's personalized deals gets this loaf of bread for 99 cents instead of the original $4.29. Loyalty cards have long given discounts to shoppers who sign up, but stores are increasingly offering personalized discounts tailored to each customer's shopping patterns. Those tailored discounts mean someone standing in front of you at the supermarket checkout line might get a lower price on the exact same gallon of milk that you're buying. Heather Kulper is one of those people who really wants to get a good deal. She's a mom in a suburb north of Seattle who writes a blog about coupon clipping and saving money. On a recent shopping trip to Safeway, Kulper pulls up a special Safeway app on her phone called Just For U. It shows her deeper discounts on products that she's likely to buy based on her shopping history. The deals are lower than the club card discount listed in the aisle. When she checks out, she gets that personalized sale price. "This is the artisan caramelized onion bread, which is normally $4.29. Priced with the Safeway club card, it's $2.99," Kulper says. "But with the Just For U personalized deal, it's 99 cents." Kulper says it feels a little bit like she's getting a secret deal. It's kind of like the old days, when you walked into a relative's small grocery store, and they gave you the family discount. Except now, this is a big corporation using computers to calculate exactly your propensity to buy and at what price. "Firms are always interested in charging different customers different prices," says Paul Ellickson, who teaches economics and marketing at the University of Rochester. Ellickson says some people just don't notice price very much. They'll pay full price for what they want. That's profitable to supermarkets. What's even more profitable, however, is if supermarkets can offer a discount to the other folks, to nudge them into buying as well. Ellickson says we're already used to paying different prices for some things. "Airline tickets are a good example — if you buy very late, you expect to pay a fair amount. If you buy early, you expect to maybe pay less," he says. "But when you're buying exactly the same product at exactly at the same point in time, and you and the person right next to you are paying different prices, you may get irritated with that." Of course, people have always gotten discounts with coupons. The difference here is that Safeway may offer one person the 99-cent deal on artisan bread, but maybe not you. Still, Safeway's president of marketing, Michael Minasi, says it's fair, because this program is open to everybody and you would get your own personalized deals. He says Safeway is trying to build loyalty. "We think it helps them consolidate their purchasing with Safeway and spend more of their grocery dollars with us," Minasi says. Other stores are trying this, too. At a lot of Stop & Shop stores on the East Coast, customers can pick up a scanner that they use as a kind of self-checkout while they shop. It also gives them personalized deals. Kroger mails individualized coupons to customers based on their shopping history. "If they want to work that hard for it, then more power to them," says Safeway customer Romi Gordon. She says she doesn't mind if other people get personalized deals — she just doesn't think it's worth her time. Shopper Keelan Lehmann says that to her, it doesn't seem right that different people are getting different prices. "I just don't feel like it should be hidden," Lehmann says. "I've never heard of it till you mentioned it ... I don't know, I don't like it." Back inside her local Safeway, Kulper is getting ready to check out. Back in May, she got a $50 gift card from Safeway to try out the personalized deal program. She says it's worked so well she switched from another store to shopping almost exclusively at Safeway. On this most recent trip, Kulper saved 41 percent with the Just for U app and coupons — $21 altogether — on her purchases. She says she's happy with her discount, and she doesn't mind that Safeway knows every tiny little detail of what groceries she buys. To Kulper, it's worth it, as long as she can save money. Copyright 2017 KNKX-FM. To see more, visit KNKX-FM. One of the impacts of a slow economy is that consumers are very careful about money. Some people are clipping coupons or using individualized savings at the grocery store; very individualized savings in some cases. Increasingly, stores are offering discounts tailored to each consumer's shopping patterns. From member station KPLU in Seattle, Ashley Gross has more. ASHLEY GROSS, BYLINE: Heather Kulper is one of those people who really wants to get a good deal. She's a mom in a suburb north of Seattle who writes a blog about couponing and saving money. HEATHER KULPER: Organic peeled baby carrots for a one pound bag for $1.49. I'm going to add that to my card. 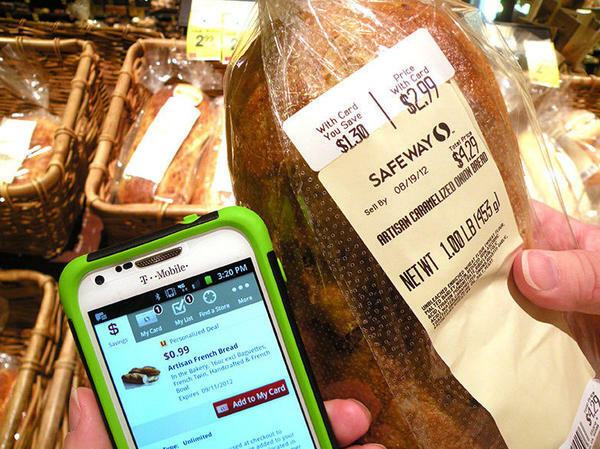 GROSS: Kulper is standing in a Safeway supermarket with her Smartphone in hand. She pulls up a special Safeway app on her phone called Just For U. It shows her deeper discounts on products that she's likely to buy based on her shopping history. The deals are lower than the club card discount listed in the aisle. So when she checks out, she gets that personalized sale price. KULPER: This is the artisan caramelized onion bread, which is normally $4.29, priced with the Safeway Club Card is $2.99, but with the Just For U personalized deal, it's 99 cents. GROSS: Do you feel like you're getting a secret little deal? KULPER: I do a little bit, yeah. GROSS: It's almost like in the olden days, if you walked into your uncle's grocery store and he said, don't look at the price tags, you're getting the family discount. Except now, this is a big corporation using computers to calculate exactly your propensity to buy and at what price. PAUL ELLICKSON: Firms are always interested in charging different customers different prices. GROSS: Paul Ellickson teaches economics and marketing at the University of Rochester. He says some people just don't notice price very much. They'll pay full price for what they want. That's profitable to supermarkets. But what's even more profitable is if supermarkets can offer a discount to the other folks, to nudge them into buying as well. Ellickson says we're already used to paying different prices for some things. ELLICKSON: Airline tickets are a good example. And if you buy very, very late, you expect to pay a fair amount. If you buy early, you expect to maybe pay less. But when you're buying, you know, exactly the same product at exactly at the same point in time, you know, and you and the person right next to you are paying different prices, you may get irritated with that. GROSS: Of course, people have always gotten discounts with coupons. The difference here is that Safeway may offer one person the 99 cent deal on artisan bread, but maybe not you. Still, Safeway's president of marketing, Michael Minasi, says it's fair because the program is open to everybody and you would get your own personalized deals. He says what this is really about is that Safeway is trying to build loyalty. MICHAEL MINASI: We think it helps them consolidate their purchasing with Safeway and spend more of their grocery dollars with us. GROSS: Other stores are trying this too. On the East Coast, at a lot of Stop & Shop stores, customers can pick up a scanner that they use as a kind of self-checkout while they shop. And it gives them personalized deals. Kroger mails individualized coupons to customers based on their shopping history. ROMI GORDON: If they want to work that hard for it, then, you know, more power to them. GROSS: Safeway customer Romi Gordon says she doesn't mind if other people get personalized deals. She just doesn't think it's worth her time. Shopper Keelan Lehmann says to her, it doesn't seem right that different people are getting different prices. KEELAN LEHMANN: I mean, I just don't feel like it should be hidden. I don't know. I've never heard of it till you mentioned it. Of course, I'm not in here that much. I don't know. I don't like it. GROSS: Back inside her local Safeway, blogger Heather Kulper is getting ready to check out. Back in May, she got a $50 gift card from Safeway to try out the personalized deal program. She says it's worked so well she switched from another store to shopping almost exclusively at Safeway. Now comes the moment of truth, a machine spits out her receipt showing her discounts. UNIDENTIFIED MAN: All right. You got 41 percent savings there. Just For U, you've gotten $8.79 and coupons and it goes down from there - $21 off altogether. KULPER: Great. All right, thank you so much. UNIDENTIFIED MAN: Have a great day. KULPER: OK, have a good one. UNIDENTIFIED MAN: You, too, enjoy now. GROSS: Kulper says she's happy with her 41 percent discount. And she says she doesn't mind that Safeway knows every tiny little detail of what groceries she buys. To her, it's worth it - as long as she can save money. For NPR News, I'm Ashley Gross in Seattle. Transcript provided by NPR, Copyright NPR.